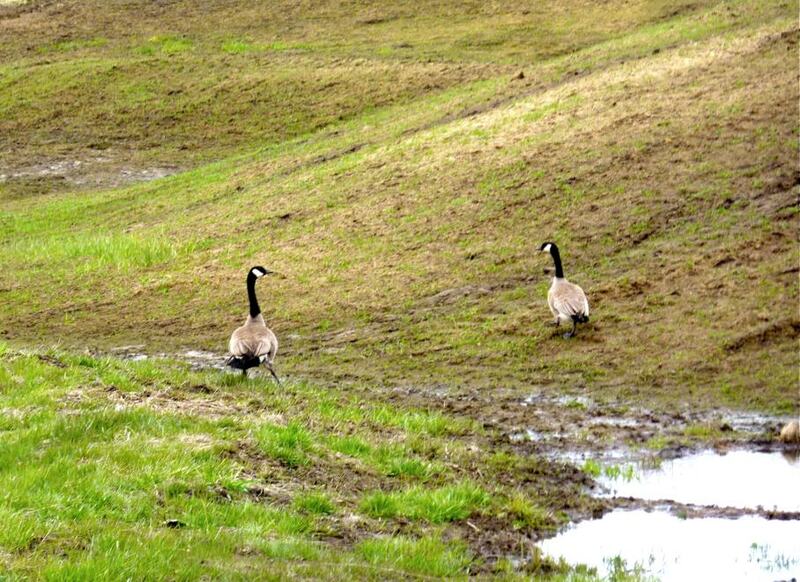 While checking on the Arboretum yesterday to see how the spring rains were treating the landscape, I came across a pair of Canada geese (Branta canadensis) grazing on new grass emerging from the seeding of a constructed area we call the Gathering Circle. The geese brought back memories of my relative youth as a budding wildlife biologist – or at least as a graduate student at the University of Minnesota with aspirations to become a wildlife biologist. The photo is a little blurry because I only had a small camera with me that I quickly poked out the window of the truck to grab a snapshot while moving on, not wanting to disturb the geese. The landscape architects and engineers who constructed the Gathering Circle might not be too happy to see the geese grazing on the new grass emerging from the seed planted last fall. But that’s life. Anything we do in the environment has both intended and unintended consequences. Besides, there’s plenty of grass to go around. As I watched the birds for a few minutes, they walked away from me warily – not completely alarmed, but certainly mindful of my presence in case I tried anything funny. The gander, or male goose, was limping badly. If you look at the bird on the left, you’ll notice its right leg being held out at an angle. The leg appears to be injured or at least something may be affecting the joint and the ability of the bird to put weight on its right leg. So it hobbles along uncomfortably, which is another reason why I moved on quickly, not wanting to make it expend any more unnecessary effort to get away from me. How do I know that the bird on the left is almost assuredly the male of the pair? That judgement comes from experience and knowledge of avian behavior. Even from this blurry photo you probably can get the impression that the bird on the left is ever so slightly larger than the goose on the right. Also notice that the bird on the left has a slightly more alert posture with its head and neck held high, observing the strange creature, me, that might pose a threat to the pair. When you observe a mated pair of Canada geese close up, you will often notice that the male is slightly larger than the female, even though they both have the same plumage, which is called monomorphism in this case. Biologists would say that males and females are “monomorphic”, and have the same plumage and coloration, which is not uncommon among birds that are monogamous and basically mate for life. Also, when you have the chance to observe a pair of geese that are feeding in spring, which often will mean grazing on young, tender shoots of grass, you will usually see the smaller female spending more time intensely foraging, while the male stands tall and alert next to her. In early spring, the female will be preparing to nest and lay eggs, and so it is critically important that she store up body reserves to have enough energy and nutrients to build a nest, lay a clutch of typically about 5-6 large eggs, and incubate them essentially continuously for about 28 days until they hatch. Newly hatched goslings are precocial, meaning they are active, covered with downy feathers, and able to leave the nest and begin to forage for themselves right away. But even so, the female still provides warmth and protection for the goslings if they need to huddle under her wings during cold weather and nights. It’s unlikely that this particular pair of geese are going to stay and nest in the WSU Arboretum. The only permanent wetland in the Arboretum is one small diked pond that doesn’t have any islands or muskrat houses. Why is a muskrat house, or more appropriately, a muskrat lodge, important? Canada geese like to nest on an open, exposed site that is protected by surrounding water if possible and provides good visibility to detect potential approaching predators. 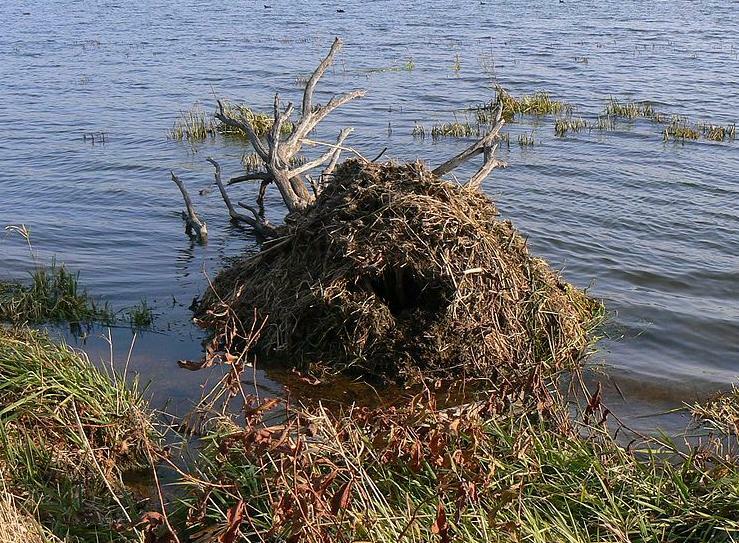 Muskrat houses, which are often made of piles of cut cattails, make a good elevated platform for geese nesting in wetlands. The surrounding water provides some protection against many larger predators, such as coyotes who will not likely swim out into the water to get to a nest. And smaller aquatic predators, such as mink or raccoons can often be successfully deterred by a fierce pair of geese protecting their nest. But we have no muskrats, and thus, no muskrat houses in the WSU Arboretum. Why not, you may wonder? I think the answer is that while muskrats are widely distributed across North America, they are not abundant here on Palouse Prairie, which does not have many permanent wetlands required by breeding muskrats for year around survival. 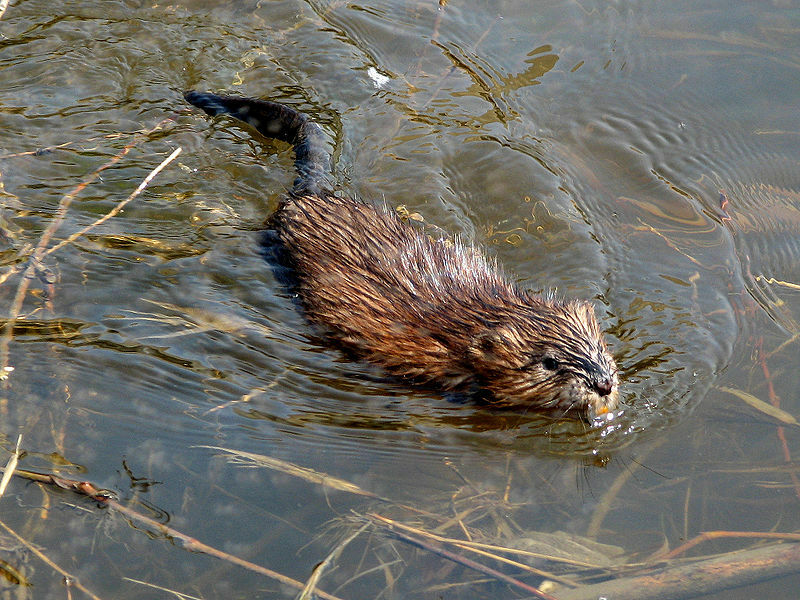 The distribution map for muskrats in Washington illustrates that they certainly can occur in the area, but their available habitat and abundance is much less than in other parts of the state. 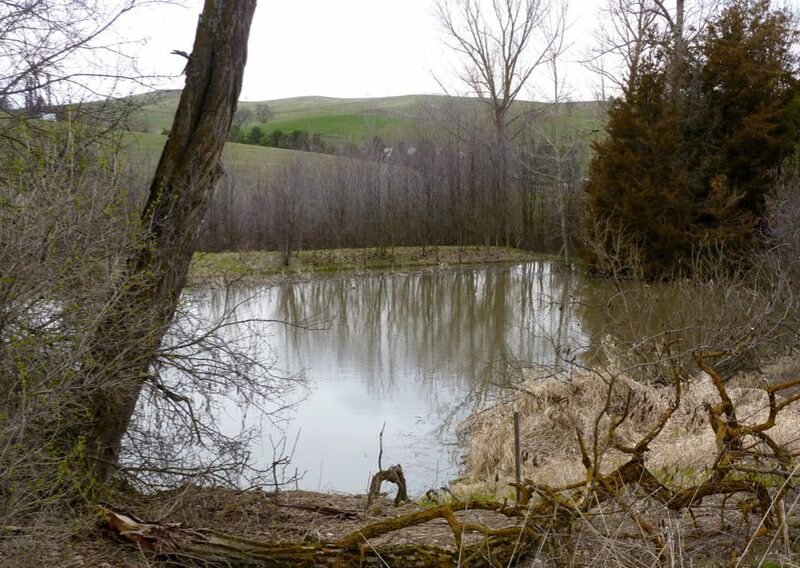 The lack of permanent wetland habitat with large expanses of cattails, coupled with the loss of perhaps 97% of original wetland habitats in Palouse Prairie means that we may not have muskrat houses, and nesting sites for Canada geese in the WSU Arboretum unless we create more permanent wetland habitats. The other option that would be easily accepted by nesting Canada geese is an artificial nest platform, such as a wooden or fiberglass box to hold nest materials, placed on top of a wooden or metal pole out in the open water of a wetland. Secure nesting sites such as these are readily used by Canada geese, but we probably won’t provide any such nest in the Arboretum either. Our wetland habitat is limited and a resident population of geese would likely cause some problems in the local area. But it was enjoyable to see a pair of Canada geese visit the Arboretum and remind me of how many years I spent working on geese and other waterfowl back in the Prairie Pothole Region of the midwest. I had a wonderful opportunity to pursue my doctorate working at a place called the Delta Waterfowl & Wetlands Research Station on the south shore of Lake Manitoba. There’s nothing quite like being alone in the middle of a 55,000 acre marsh in Manitoba and being surrounded by thousands and thousands of white Snow geese and many hundreds of Tundra swans all staging in the area, all waiting for the cold Arctic winter to thaw so they might finish their northward migration and nest in the Arctic spring. When that happens you feel the life and pulse of the living Earth burst forth around you in a sudden cacophony of calls, whistling wings, mating rituals, and frantic preparation for breeding. The cycles of rebirth, growth, and seasons pass quickly by like cloud shadows under the sun when you have the opportunity to watch and study wildlife and nature in any magical place on Earth, such as the Delta Marsh. I think about how much I learned there from university mentors, my peers all intensely interested in waterfowl and wetlands, scientific literature, and practical field experience gained with no one looking over my shoulder. And I wonder how many young biologists today even know about the Delta Marsh. How many have read the early descriptive scientific works, and how many have seen the beautiful drawings and paintings of Al Hochbaum, the first scientific director of what was then called the Delta Waterfowl Research Station? How many understand the intricate life history and mating strategies of different waterfowl species? For many people, they’re just swans, geese, or ducks, and that’s that. They don’t know how to turn the cover on the book and read the individual stories within, and so many rich mysteries go unread and unsolved. For a few minutes, I think and feel all this and much more as I watch the geese grazing in the Arboretum. But for these geese, it is their spring, right here, right now. It is their fresh cycle of life as they seek to find food and find a safe place to nest and raise their young, who will then rapidly grow from awkward goslings into sleek adult looking birds by fall and follow their parents to a more southern location for winter as a family group. I often have moments like these in the new WSU Arboretum & Wildlife Conservation Center. I may be working or walking in the wildlife center and perhaps have a hawk circle low over my head and give its sharp piercing call. And I think about all the people just a relatively short distance away on the main campus of Washington State University who are working in buildings, probably sitting in front of their computer or in a classroom. How much they miss. I’m convinced that to be happy and well, we not only need connection with other people, but we need connection with land and plants and animals and all the mystery of natural life around us. The internal, imaginary worlds created by the human mind are truly stunning in their complexity and creativity. And yet, the smallest patch of earth and the smallest insect is by far more complicated and beautiful than anything we have created. We are not alone on this Earth, and we do well when we remind ourselves of this fact by taking a few moments every day to stop and see and feel all the life that surrounds us. Hopefully, the pair of geese in the Arboretum find a safe path through the hazards of nesting and caring for eggs and raising young. Perhaps the lame gander will heal and regain better use of its leg. That would be nice. But it is spring on the Palouse and life is bursting forth, including the leaves emerging from the bulbs of what will become the beautiful blue, native camas flowers we’ve started in the Arboretum. Spring is good. And the cycle of life, growth, and renewal begins again. I can see that writing short science blog posts will be a challenge for me. There is so much to discuss and marvel about in the natural world. But I guess that one can always return and continue stories, as we plan to do here in Nature @ WSU on a regular basis. Please join us again as we describe the long journey, the passing of seasons, the cycles of life, and the development of the WSU Arboretum and Wildlife Conservation Center. Good observations of the Canada geese 🙂 i used to watch them all year round in a nearby lake and swamp area. They can appear quite aggressive when protecting their children at springtime. Yes, Canada geese certainly can be aggressive when defending their young goslings. In fact, the most aggressive tend to be those geese that are somewhat used to seeing and being around people. They can be the worst! But in our area, and on the WSU campus, geese are not particularly common, and Pullman doesn’t have many permanent ponds or wetlands that would be suitable for their nesting, so we likely won’t have many problems with geese. Ironically, when I began my graduate career for my M.S. degree, I worked on the Canada goose populations that were being established in various nature reserves in the Minneapolis-St.Paul metropolitan area. At that time, many people were excited about establishing flocks of geese. And it wasn’t too many years after that, where they became a large problem in some areas, and they eventually had to begin programs to limit their numbers. Too much of a good thing I guess.